Maxwell Colette Gallery is in one of those refurbished storefront deals along Ashland Avenue near what some of the old people may know as Polonia Triangle. I spent the first 10 years of my life in or around that area and I never heard a single person call it that. I don’t know what they called it, but I know it wasn’t that. 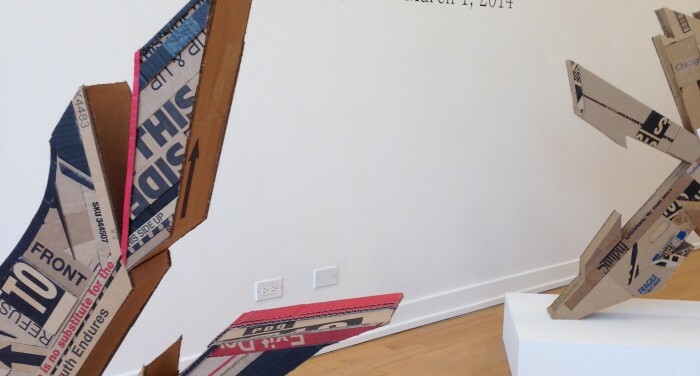 Stepping through the gallery’s front door is like walking through a portal. A little chime goes off to let the proprietors know you’ve arrived, and when the door closes shut behind you, the sounds from cars, buses and passersby virtually dissolve away, lending a bit of urban ambiance to the scene. You leave a dingy sidewalk littered with paper bits and step into a clean room with white walls, music like from a high-end jeans store playing in the background. Immediately I was confronted by art. Alecks Cruz’s art to be exact. Arrows, barcodes and colorful accents pop out amid hard angles, straight sides and swooping edges. Here and there you catch “UP,” “Fresh” or “Chicago.” There are bright reds and oranges, sharp blues, random numbers, bold black lines — all of it as essential to the urban landscape as anything you’ll find just outside the gallery, so cluttered and go now, so modern consumer, the overstimulation, tons of visual noise. Even up close it’s hard to tell how Cruz put his sculptures together from so many disparate pieces. You know it must be glued together, maybe even a bit of tape in some places, but you couldn’t tell by how the pieces sit together, as if they’re all shards of the same structure, as if these six sculptures just fell from the sky and were put on display. The six sculptures sit low to the floor on blank white platforms, except for the smallest one — with orange contours and what looks like exclamation marks jutting from an arc — which sits on a raised white platform against the back wall. I spent about 30 minutes at Maxwell Collette, circling each sculpture and kneeling to get a closer look. I especially like one of the red pieces, the one I call “Truth Endures.” It’s the boldest, at least for me. A couple days later I wrote Alecks Cruz and asked for an interview, which he agreed to. What follows is the result of a few exchanges between him and I via email. Why did you choose cardboard as your medium in “Redemption?” Had you considered other discarded materials, a mix of stuff, or were the works always going to be sculpted from cardboard? 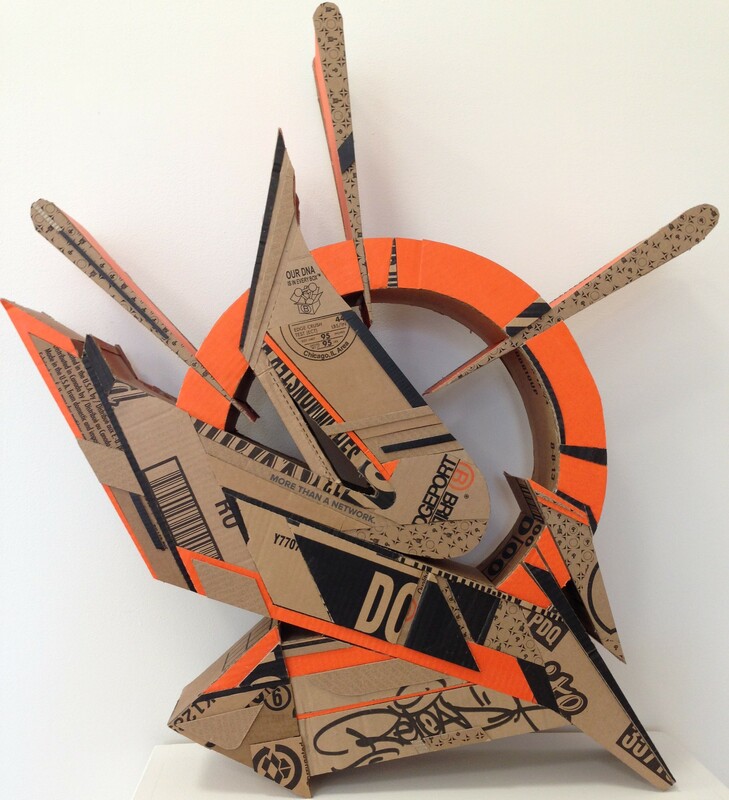 Honestly, cardboard was never intended to be the medium for my sculptures. My first attempts at making graffiti sculptures were made of card stock and paper on a much smaller scale. My first few attempts were successful, but it was difficult to access tight spaces. This challenge ultimately was forcing me to compromise details and simplify my designs which left me unsatisfied. 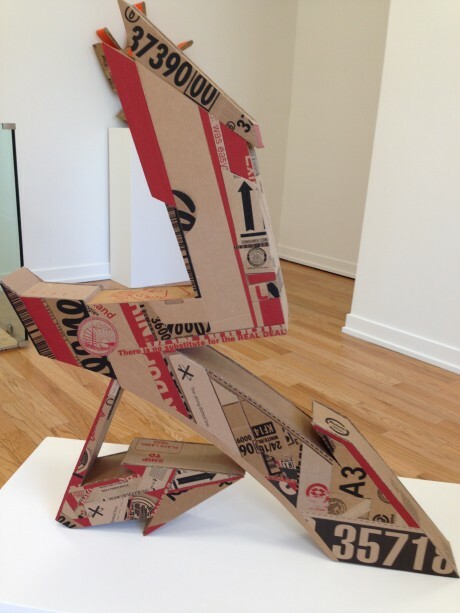 Cardboard was the next logical step since it is stronger and pliable. I took this on as more of an experimental project and what I discovered was something bigger than what I anticipated. The objective was solely to build 3D letters and what I discovered was something much more interesting. Printed letters and barcodes on the cardboard transcended from being impertinent information into a texture. You’re also a talented graphic artist. This might go without saying, but do you draw blueprints for your sculptures beforehand, or do you have a basic idea of what you want to create and sculpt as you go along? Were the materials gathered before or after you had an idea for a sculpture? Thank you! Absolutely, every piece begins with a sketch. The concept is born in my mind and then I sketch each piece while keeping in mind that I will then have to build it. I eliminate any foreseen obstacles, but there’s always challenges that present themselves as I build, but I quickly find ways to resolve them and use that knowledge for the next piece. Tell us a little about growing up in Berwyn. How did life on the Southwest Side spur you into becoming an artist, and how does your environment and experience influence your art? For most of my childhood I was raised in Melrose Park. I’ve only lived in Berwyn for a year now since I bought my house. I have moved a lot my whole life so if feels good to know I’m not going anywhere for a while. I’ve always identified myself as an artist since I was a child, but it wasn’t until high school when I discovered that I loved hip hop. I attended Roger C. Sullivan High School in Rogers Park (where I lived at the time), and there I was introduced to graffiti. Ever since then I knew this was something worth investing time and energy into. I’m inspired by graffiti and “street art” but I am really inspired by people. People striving for something better. And I see that in Chicago. Everyone has their struggles, and they all come in a variety of ways. I hope to create art that can inspire people, and in doing so, I make an effort to build community. If you could explain the importance of art to the kids of today or someone in your generation who maybe doesn’t see any value in art, what would you say? What for you defines good art and bad art? And how can three-dimensional art remain exciting and relevant in a world increasingly dominated by two-dimensional media? The next generation is what’s important. Art presents to us our past, present, and future. It belongs to all of us. The best way to explain to kids how important art is, is to show them how important they are. As far as good and bad art, art is subject to criticism, which is solely a matter of opinion. I’m not sure if the world is increasingly dominated by two-dimensional art. I think it’s quite the opposite. We’re seeing the demand for 3D media more than ever. Art is the vision behind every advancement we make in technology. We can now watch television in 3D in the comfort of our own home. 3D printers are now available for the common home. These are some big indicators that there is a high demand for 3D art and media. I don’t think one will replace the other. I can see them only enhancing how we use them both. What can we expect from you in the near future? What do you do when you’re not physically working on something? I’ll definitely be exploring more 3D pieces. I’ve only scratched the surface and I’m looking forward to collaborating with some very talented artists. While I’m not working on art I’m spending time with my family and friends. Making new friends. Answering emails and doing interviews. Oh, and I’m looking forward to getting back on my skateboard, it’s collected a bit of dust. 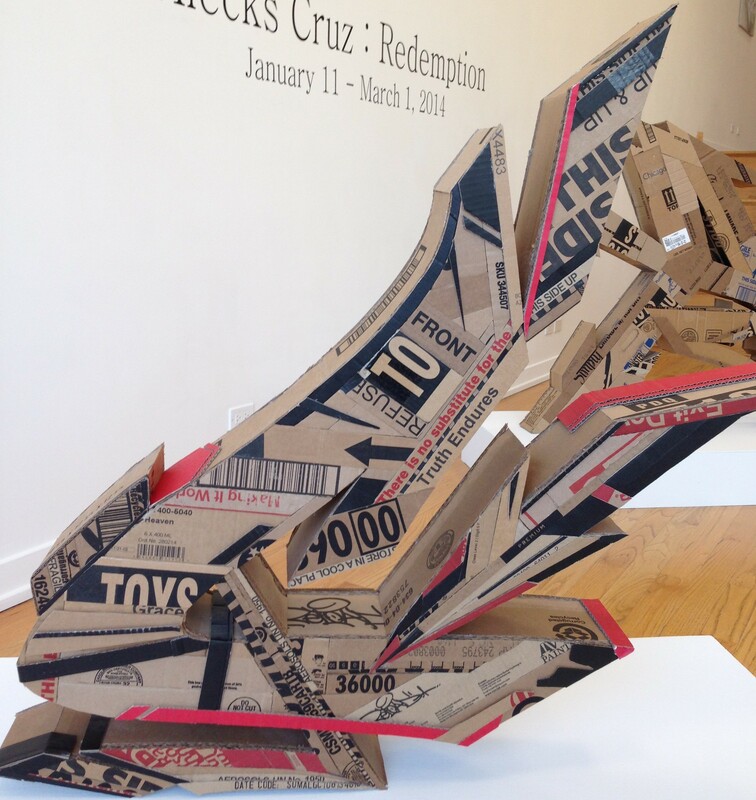 You can catch Alecks Cruz’s “Redemption” at the Maxwell Colette Gallery at 908 N. Ashland Avenue in Chicago. The show runs through March 1.